It has been an interesting time in politics lately. All kinds of political machinations have been at play with intrigue, drama, the odd ear picking and just a sniff of scandal to make the TV news interesting. Who says the New Zealand political landscape is boring. Not lately. If ever there was a time to pop the popcorn and grab a seat, then now would be that time. In typical Principally Mused style, I have been wondering. In fairness, so much has been happening that I have been wondering more than writing. In particular I have been wondering about what the new alliance between The Internet party and the Mana party means for NZ politics. I am going to add my 10 cents worth of wonderings to this issue, take it for what it is - just my wonderings and observations. The merger - 5 key wonderings. Unless you are currently living under a rock, you will have no doubt heard all about how Kim Dotcom and his The Internet party has formed an alliance with Hone Harawira and his Mana party. 1. An alliance with Mana - clever and strategic. On the surface of it, it seems a strange alliance and an unlikely coupling. Plenty of pundits have written on the pros and cons (as they see them) and I don't feel qualified to sit here waxing lyrical on the ins and outs of the morality of Maori seats vs general electoral rolls, 'coat tailing' claims and millionaires motives. The way the right wing is going on about this alliance you would think an alliance had never been formed before. The irony here is that National has forgotten its own roots, as it was born out of an alliance itself. With that in mind, perhaps it should look at where it got to and be less dismissive. Big things are born from small beginnings. But, I have been wondering and thinking about this from a strategic perspective. Looking in from the outside, and having heard both Hone and Laila speak about their motives and their perspectives, it reads like a smart marriage of convenience. There's a unification around wanting a change of government, a group of people who all bring a variety of resources to the table - from a seat, to money, to activism, to political capital. It's easy to judge this and question motive but that aside, it's clever. 2. Crowd sourcing policy - savvy, smart idea. This is clever. Instead of making things up, they are doing the smart thing and asking people what they want to see changed and what would make a difference. I've read The Internet party draft education policy and it's a good start. I will be curious to see how it merges with Mana but thus far it is encouraging. The media this weekend scorned them for 'crowd sourcing' but actually, it's real power is in harnessing the voice of the young disaffected 'non voter' who will feel their voice is valued. Pure genius really. One of the biggest criticisms of the current reality we live in is a lack of true consultation and an appearance of not listening to the public. To tap into this is good policy development. Laila was smart this weekend when pressed about free tertiary education and how it might be paid for. Instead of promising to abolish this or raise taxes on that, she made it clear that this was a discussion to be held with the voters. It is wise to have a public debate around things that are important. It has been long overdue. Of course there will be a cost - the real question is, what is the public prepared to lose? My wish is that we could have had the same debate on education. Instead we are being lumped with a policy that could have used that money to make a real difference. More about that soon! 3. Appointing a seasoned, respected, articulate and passionate ex MP as leader - very smart. Laila Harre is a force to be reckoned with. She's proven she's capable of holding her own, both as a past MP for Alliance and leader, and this weekend by expertly batting off aggressive and over zealous interviews by the media. It was a clever move by The Internet party. She brings mana (pun simply conincidental) and credibility to the table. There has been criticism over her age but thats is, in my opinion, posturing from the right wing as they attempt to discredit her. Her experience and reputation speaks for itself. It is another stroke of genius and has just upped the stakes to one of viability. 4. Investment of capital - an opportunity too good to not capitalise on. Whilst opponents and over eager journalists are touting the Mana merger as a blatant money grab and a millionaires puppeteering, I have been wondering a bit deeper than that. It is a little naive to think that this is a marriage born out of love. Of course, this is about convenience. I ask this - so what? It is not the first time someone has put their money where their mind is, and it won't be the last. Would the others like to have that kind of money at their disposal? You bet. What this does do, is give two minor players a chance to get their voice out and to even up the playing field somewhat. There has been a significant investment made by Kim Dotcom, and I am wondering just how big this investments impact will be come election day. The fact that they are being blasted for the investment by the media and the right wing seems somewhat hypocritical. Cough Colin Craig cough. Cough Act cough. Cough Cabinet Club cough. 5. Paying candidates to run - a stroke of ingenuity! To be able to pay their candidates and their leader as they head off to an election is something all parties should do. It values the contribution and skills of the candidates and means that candidates won't lose out. While it would be nice to think that candidates run for parliament out of the kindness of their hearts, the reality is that for many, they have to leave jobs and security. The sceptical would say that people are only putting their hands up to run because they will be paid. I am sure there is a smidgeon of truth to this but I also think it shows that the party value people and are prepared to put their resources behind them. This allows people of calibre to stand up. Could it all end in custard? Perhaps, but that is not for me to crystal ball gaze over. The players in this are all mature and savvy participants and I am pretty confident that they have all gone into this arrangement with their eyes wide open and with various alternative modes of operation already thought out. Right now they are united in a common cause and the investment Kim Dotcom is putting into this is an opportunity too good to pass up. It will give then all a 'super sized' virtual megaphone that will prove, I believe, to be invaluable. With the above in mind, I would gently remind others that it is always smarter to play with and factor in the unknown rather than discount or disregard. Just, in, case. Finally, let me sum up my wonderings on this matter. Like a game of chess, there is a level of strategic manoeuvring at play here, where this new team are pulling their collective resources together to place themselves firmly on the board. My biggest wondering here is how are the other parties on the left going to ensure they are part of this strategic positioning to maximise the left vote. There is an opportunity here to maximise the vote for the left and to block out the right. 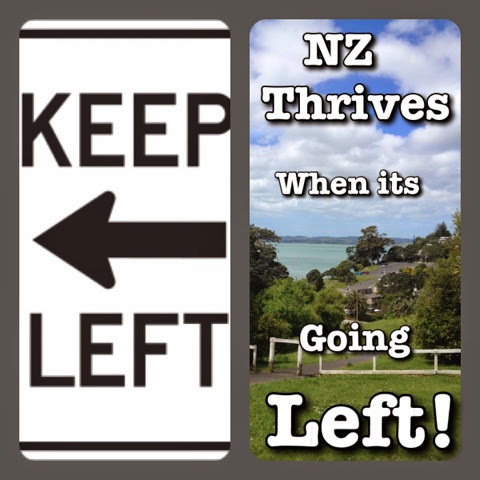 Each of the parties on the left are unique in terms of their constituency, yet are united in the common cause of wanting a better future for New Zealanders. Labour has a track record of working with most of the current parties on the left, and I have no doubt that they will be able to work well with this new alliance as well. Labour and the Greens are a proven combination. They can do this. More about the reasons why the left are a serious and proven contender another day. Suffice to say, rather than seeing The Internet Mana party as a threat to the votes of the left, they are instead the party that has the potential to reel in the lost voters. Now is the time for all the players on the left to be united, show they can work together and that they have the back of all New Zealanders. It is unwise to live up to the media's label of being 'fractious'. Now, more than ever, unity is critical. This new player in the political world has certainly added a new element to politics in NZ, and watching how this plays out will be fascinating indeed. Bring on the election - things just got interesting.